The soft, waterproof and elastic neoprene material of the vest is designed to fit your dog tightly for maximum protection against the elements. It keeps body heat in due to its excellent thermal insulation, thanks to thousands of tiny air bubbles embedded in the synthetic rubber material. It has also been designed with comfort in mind. The dog vest is easy to put on and the adjustable straps ensure a snug fit so you can be confident that it stays in place, making it an ideal choice for light walks or more robust training sessions. Additionally, its phosphorescent light reflective strips ensure high visibility in all conditions. 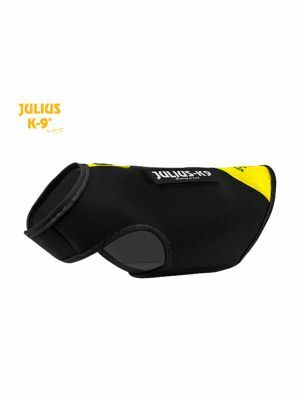 All of Julius K9's dog clothing are used and trusted by professional trainers and pet owners alike.